W4 Wall Tattoos take your photos or artwork and transform them into re-positionable and removable vinyl graphics. Perfect as unique graduation or birthday gifts or as corporate logos or art. When you need full vibrant color that can be applied to nearly any exterior surface, consider a W4 Signs Brick Wrap. Enhance your marketing efforts with a new logo design, vinyl truck wrap, building sign and more from the creative design team at W4 Signs. We love wraps and anything automotive. Get your vehicle noticed with custom vehicle graphics like full wraps, US DOT numbers, or vinyl lettering from W4 Signs. Our unique building signs will wow your customers and be the envy of your competitors. Knowing they needed to enhance their marketing efforts, owner Sean Cash approached W4 Signs about a complete rebrand for Lucky’s Diesel Shop. Like many projects, the rebranding started small with a logo and has moved into mobile advertising, business stationery and a large building sign. Above is an example of the original artwork for Lucky’s Diesel Shop brand make-over. When your business needs a fresh start, W4 Signs is ready to work with you. Put our professional design and installation team to work on your project by calling 810-588-4703. The glasses, the smile, the bold colors. 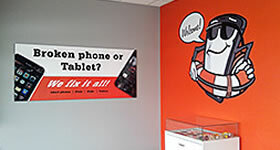 When Cell Savers first walked into W4 Signs, we knew there was something special about this company. See how W4 Signs designed his logo and created retail signs that reflected the unique branding of this company.